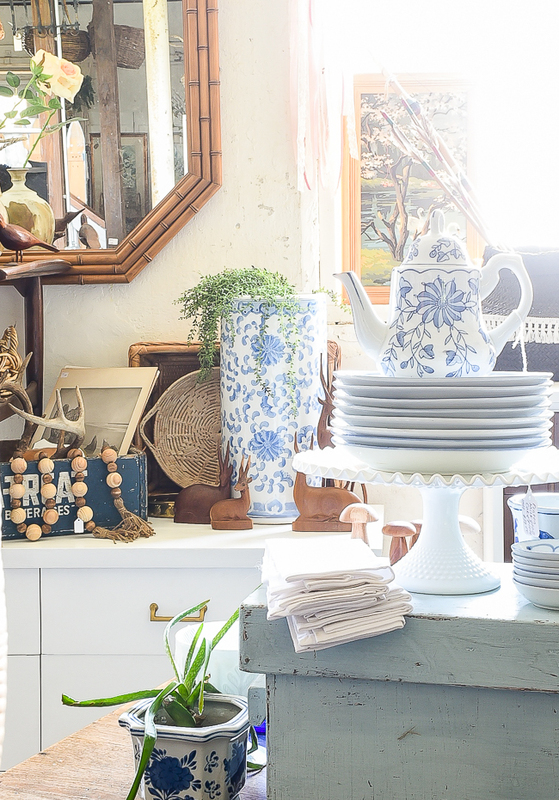 A collection of beautiful custom painted furniture and unique vintage finds at Sweet Clover barn! I could not be more excited about today's post! If you remember, a few months back I announced that I was joining my friend Cassie in her booth at Sweet Clover barn in Frederick, MD. 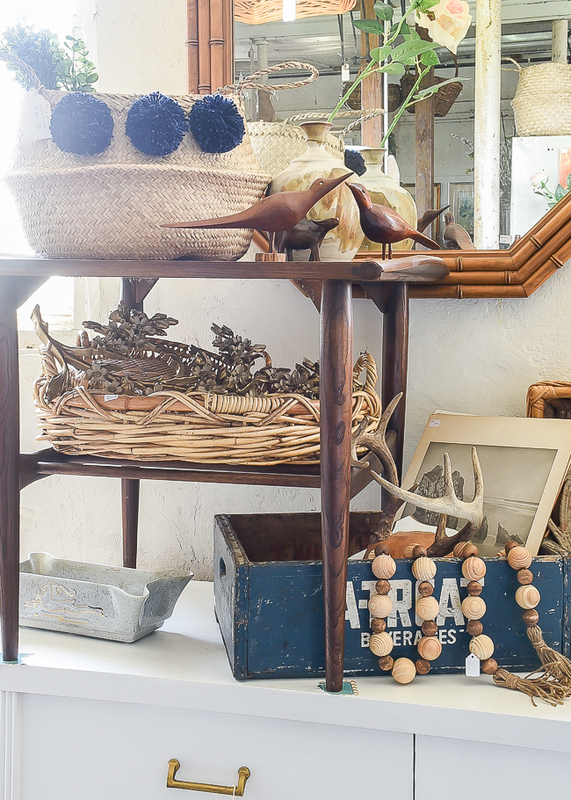 I "met" Cassie through blogging years ago and have always been a fan of her eclectic, vintage, boho style. 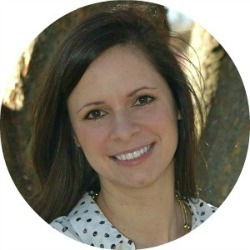 Over the years, I'd message her every now and then to pick her brain about design and color questions then we officially met about two years ago at the Haven conference in Atlanta, GA. I knew she was a great person, but after getting to know her better I can truly say she is one of the funniest, sweetest and most genuine people I know. I am incredibly lucky to be working alongside her and look forward to sharing our Sweet Clover space with you each month. The upcoming May sale is the first sale that Cassie and I are collaborating together on and I am more than thrilled to share our space with you today! 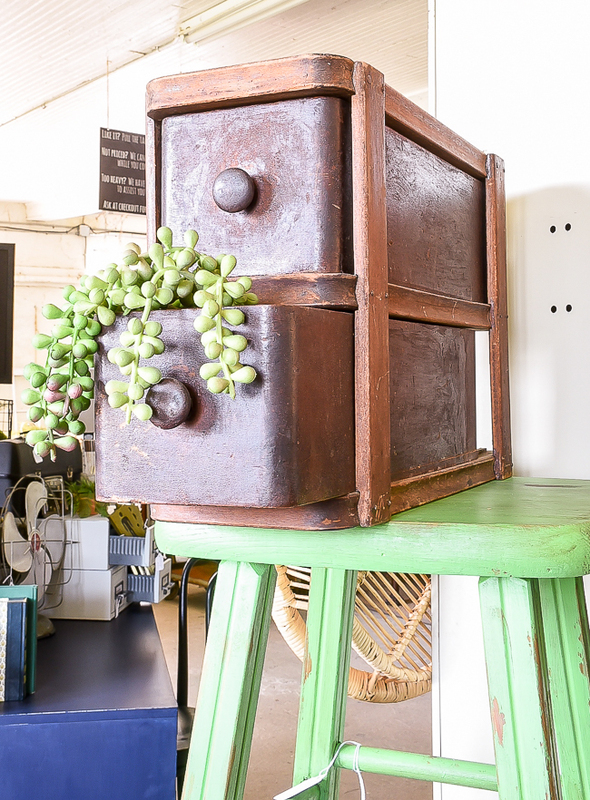 We went a little more industrial and of course injected our favorite cool tones, blue and green. 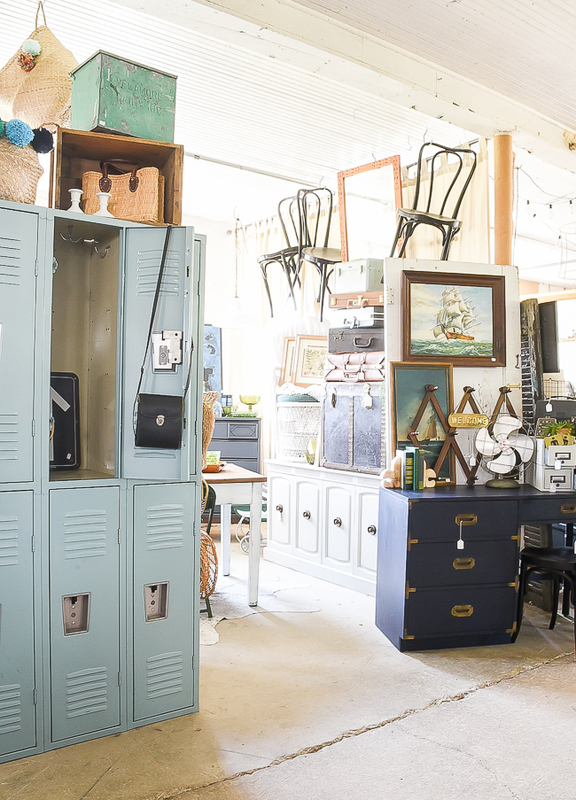 We styled the front of our space with the set of large blue lockers that I picked up a few months ago. 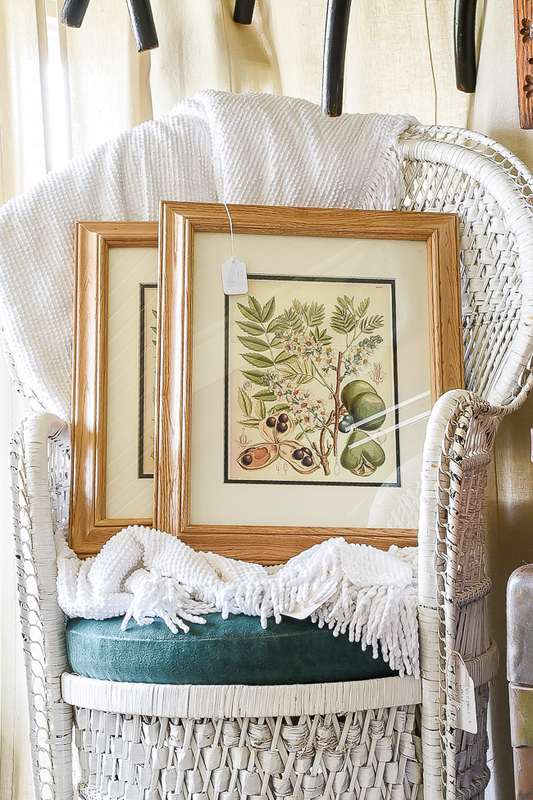 They would be perfect for an office, kids room or mudroom. If I didn't already have a set in my office I would be hanging onto these guys for sure. 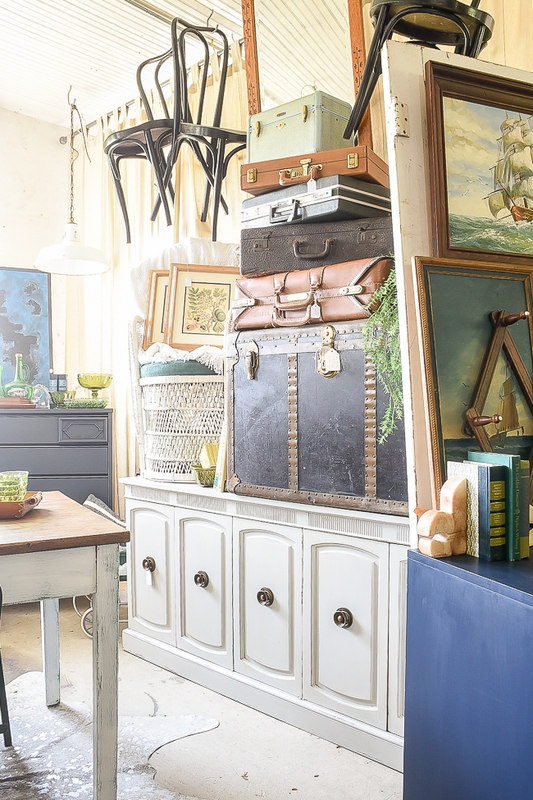 Next to the lockers is the Coastal Blue Campaign desk that I shared a few weeks ago and my favorite vignette in the space. 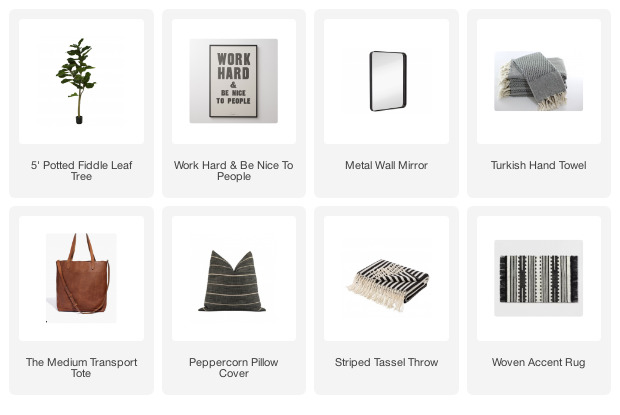 It's styled with a few of my favorite finds including an amazing vintage fan that my dad found for me last week. Just past the desk a beautiful gray Neoclassical sideboard that Cassie shared on her blog as well as a collection of vintage suitcases and briefcases. The Iron Ore and two-tone MCM dressers are just beyond the sideboard and are styled with a collection of glass and wicker. 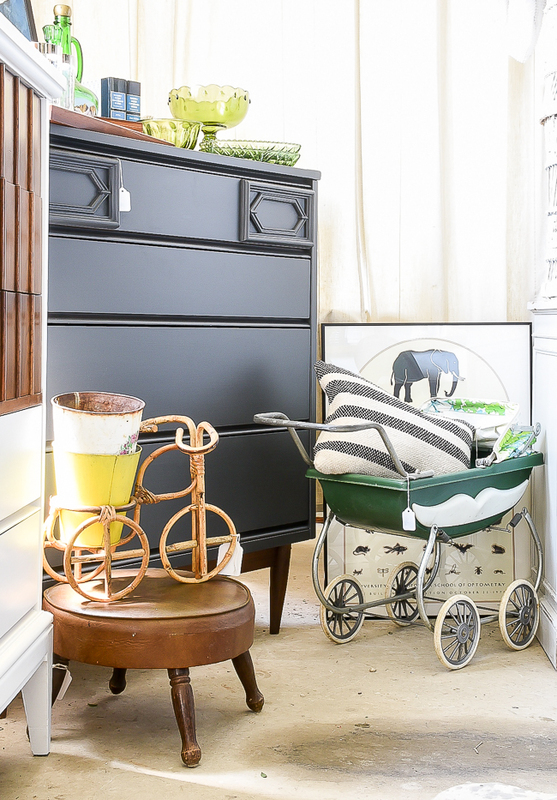 How cute is that little 70's baby doll stroller? I recently found it at Goodwill and couldn't bear to leave it behind. It was quite dirty, which may or may not have involved bird poop but after a good cleaning it shined up nicely. 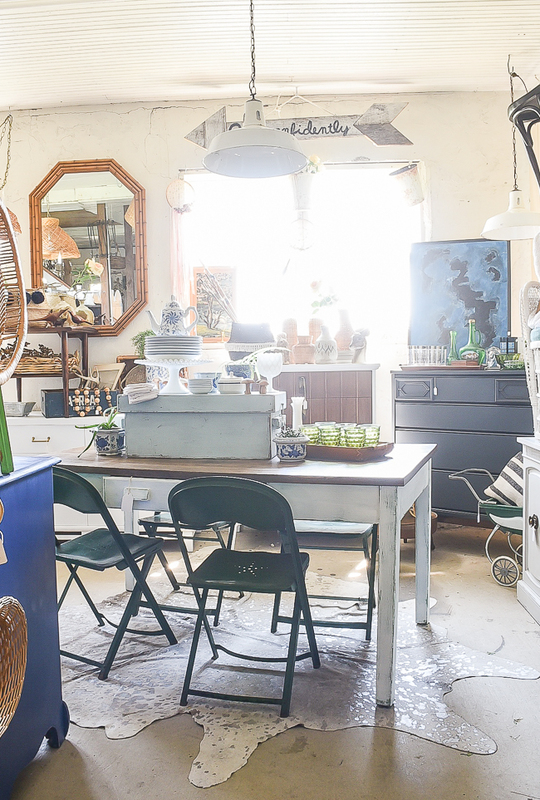 An old oak library table sits in the center and is accompanied by four metal folding chairs and a collection of milk glass and blue and white pottery. 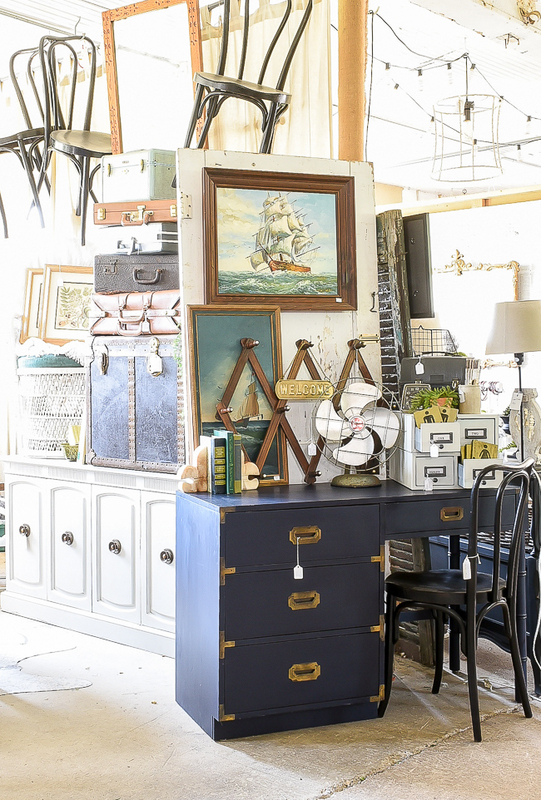 Above Cassie's white and gold MCM dresser is another collection of wood and wicker as well as a few touches of blue to coordinate with the blue dresser across the space. 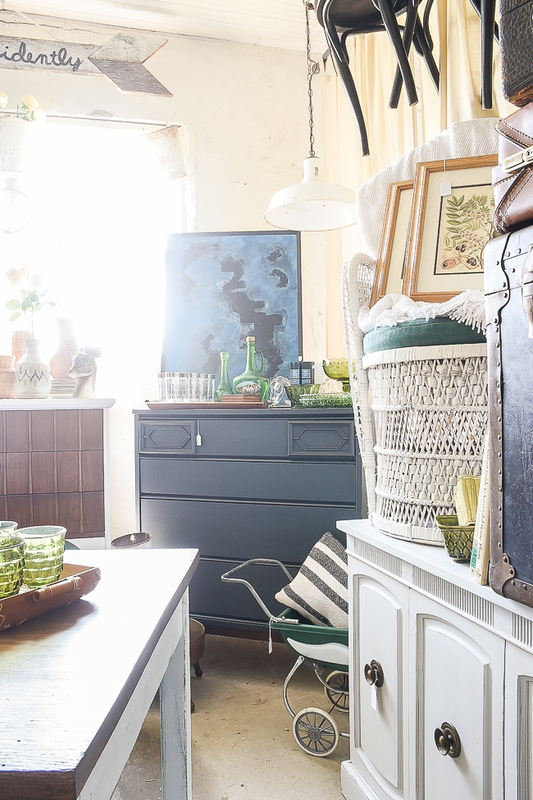 A collection of amber jars and a touch of greenery is a nice contrast to the bright blue dresser below. 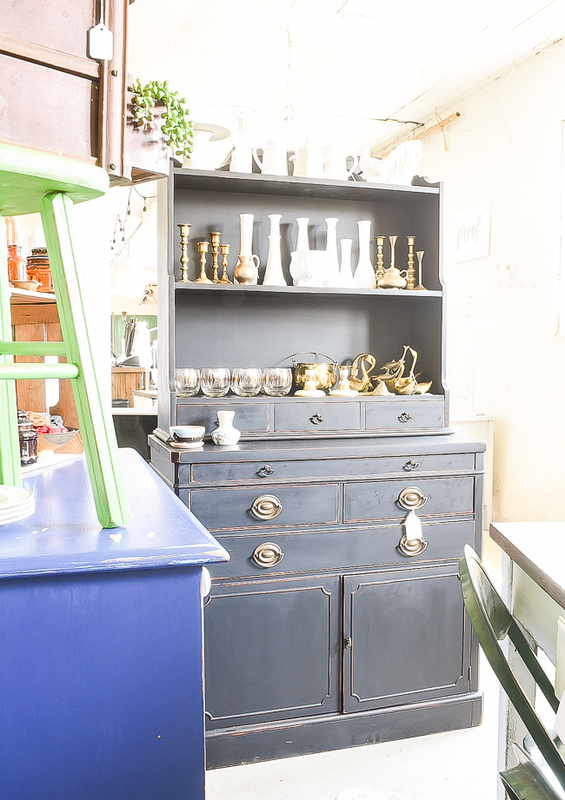 Next to the desk is a gorgeous antique hutch topped with a collection of brass and milk glass. Our space for May is a perfect blend and representation of our joint styles. 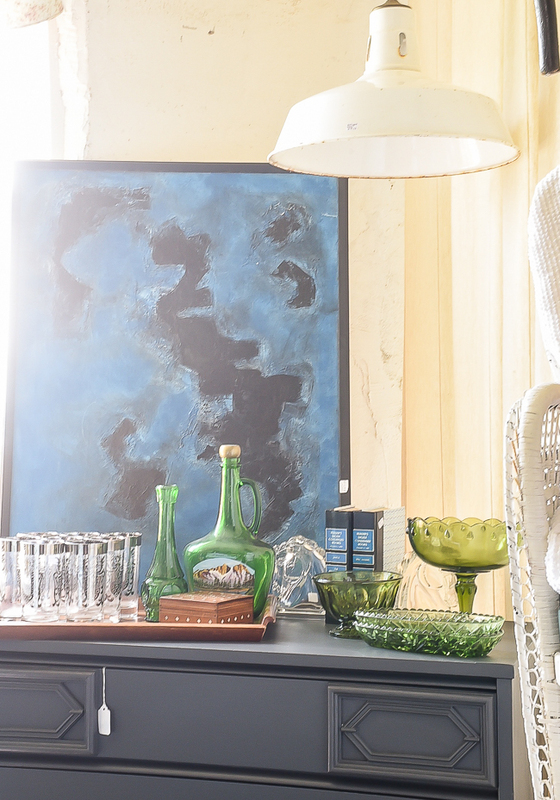 There are so many pieces I love and would have them in my own home if it didn't turn me into a hoarder. 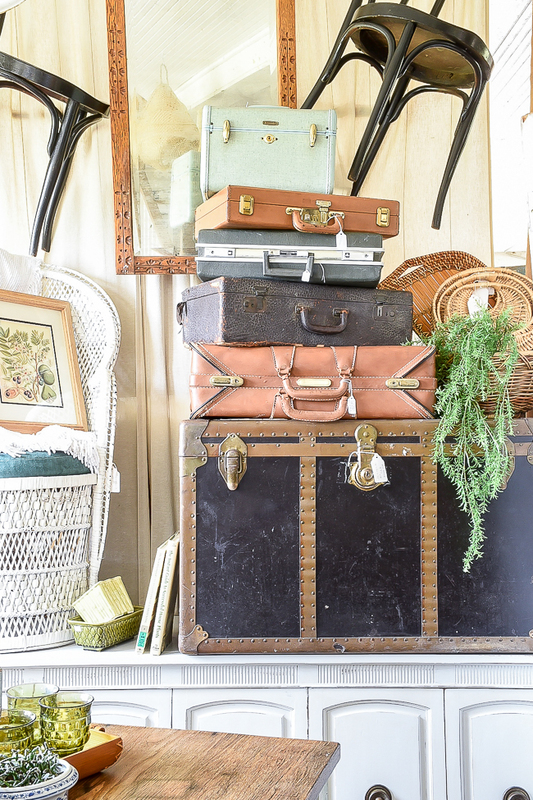 I'm sure my neighbors already think something is up with our oversized two car garage packed full of furniture, flea market finds and thrifted decor. What can I say, it's what I love and the opportunity to join Cassie could not have come at a better time. 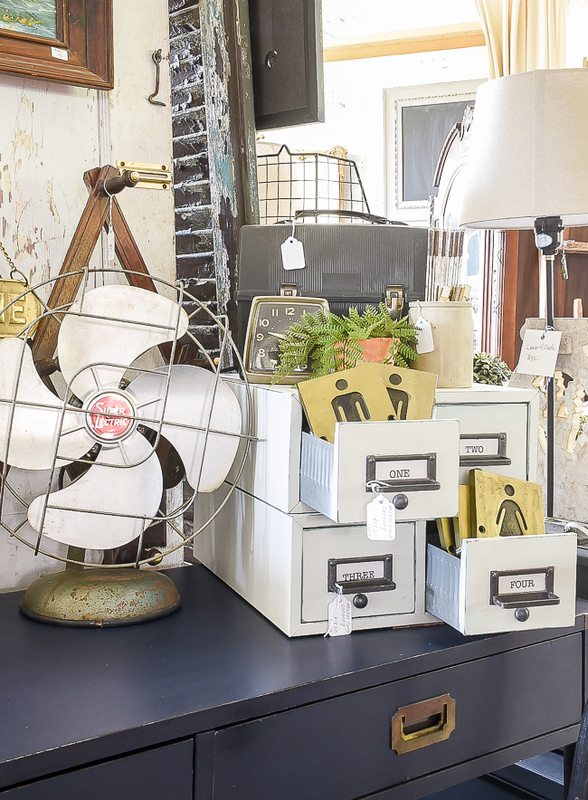 If you're local to Frederick, MD stop on by and check out the barn. 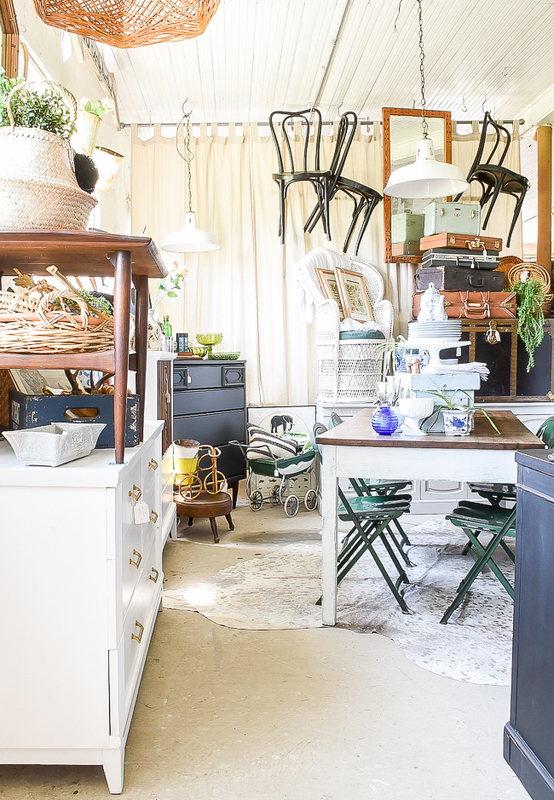 It's packed full with vintage goodness and I promise you won't be disappointed! 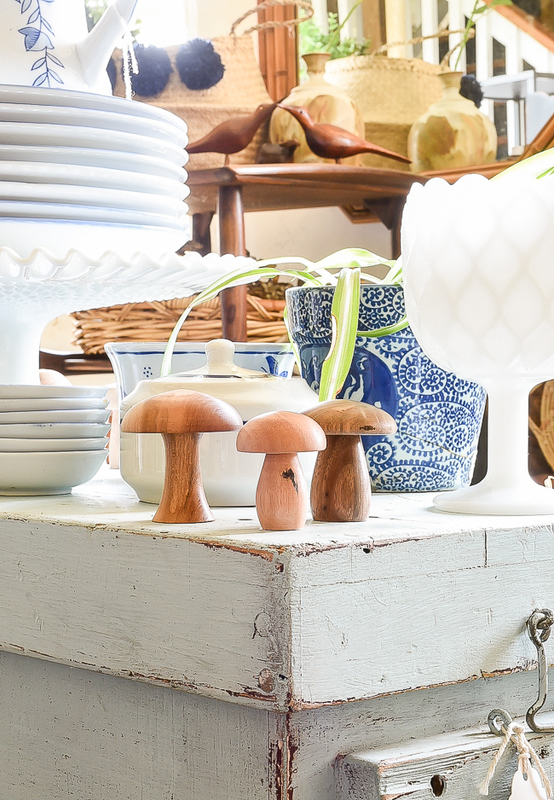 Very cute little shop, with lots of great items! I would love to come and take a look around, but alas, I am in Canada. I need/would like those blue lockers for my entrance! Thank you! 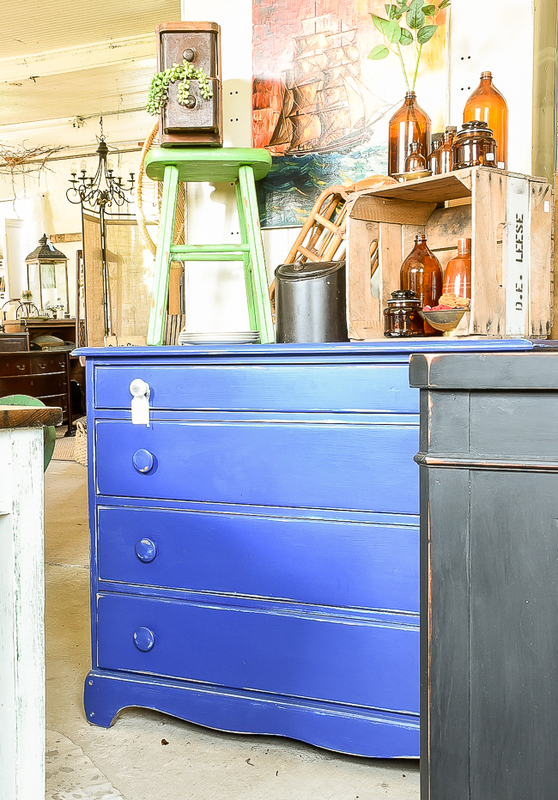 The blue lockers are so great and will make a great addition to someone's home. Everything looks SO beautiful! So, so excited for this new adventure! Hi Lynda! The framed print is Cassie's and I believe she has it priced at $65. Love, love, love. I wished I lived in Maryland because I would be stopping by to shop, shop, shop. Thank you! 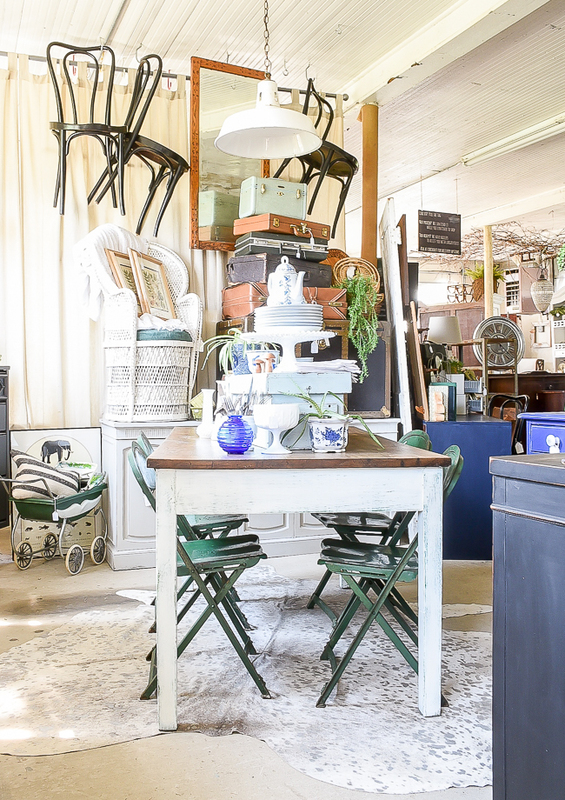 There are so many incredible vendors and so much vintage goodness. If you're ever in Maryland and we are open make sure to stop by. Your collaborative space is stunning - everything is styled and done so well! I can't wait to learn how you do! Wow! Everything looks great. I wish you the best. I do not follow many people but you had me at Dollar Store DIY's. I wish I lived in or around Maryland but Florida is just too far. I wish you the best but I don't think you will have any problems selling your wonderful items!! OMG Adorable!!!! LOVE the blue campaign desk but alas I am in the northeast. Your shop will soon be a "destination". All the best. Everything looks so beautiful! How are we to choose just one piece? I feel like getting it all to myself, hahah! This is so exciting Katie! Wish I could come shop!